Relaxed and contemporary accommodation with your own separate access, Lake Okareka Loft offers you a supremely comfortable bed and surrounds with ensuite bathroom, tea/coffee making facilities with microwave, fridge and mini oven along with Satellite TV, DVD and broadband access. Sky Sport is available on request. We can record the big game and you watch it when you desire. Whether you are a mountain biker, traveller, on business or on a couple's get away Lake Okareka Loft will meet your needs. With close proximity to the lake ( kayaks available) and an easy 10 minute drive into town you are perfectly placed to enjoy the water, the forest and the town. Breakfast provisions happily provided by arrangement. Ample room for a portacot. A local Okareka spa offers an array of packages. 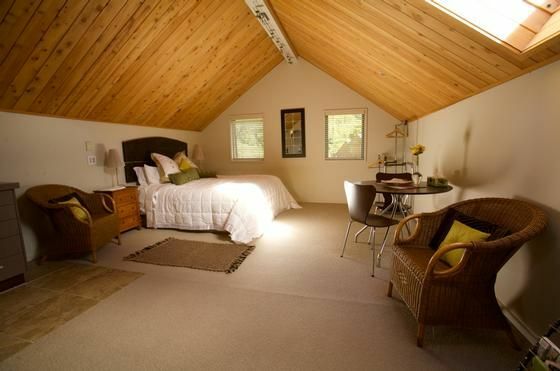 The loft contains one king bed with ensuite and has its own access. For larger groups please see Lake Okareka Cottage which sleeps 5. $350/night for a group of up to 7 people using both the Cottage and Loft. Plenty of space for toys- bikes, boats, kayaks, floats. Absolutely wonderful location and fantastic hosts. Can't recommend highly enough. Have already recommended to other friends that also regularly stay at the lake. Will definitely be back. Everything was as described with a few unexpected added touches (eg. Everything was as described with a few unexpected added touches (eg. forgot milk and there was some in the fridge). Had the best sleep I’ve had in a while on that bed and the location was great - just a short walk to the lake. We thoroughly enjoyed our stay! Lovely property, spotlessly clean and quiet. Lovely property, spotlessly clean and quiet. Very close to lake. We really enjoyed our two nights. We really enjoyed our stay at the loft, it was definitely worth driving a few minutes out of town for this cosy, private and well-equipped space. Thanks Suzy for the lovely stay at your place. Beautiful place to stay with a quick walk down to the lakend. Beautiful place to stay with a quick walk down to the lakend. We thoroughly enjoyed our stay and the loft was clean and very comfortable. Amazing walks and the use of the kayak was a bonus.